Plastic is part of the fabric of everyday life, from bags to bottles to synthetic clothing. In 2014, global production amounted to 311 million tons, up from 225 million tons in 2004, according to manufacturers group Plastics Europe. Plastic waste now litters the Earth, with much of it ending up in the oceans in the form of tiny fragments, or microplastics. Moreover, they absorb toxic chemicals and are being ingested by marine animals and climbing the food chain. 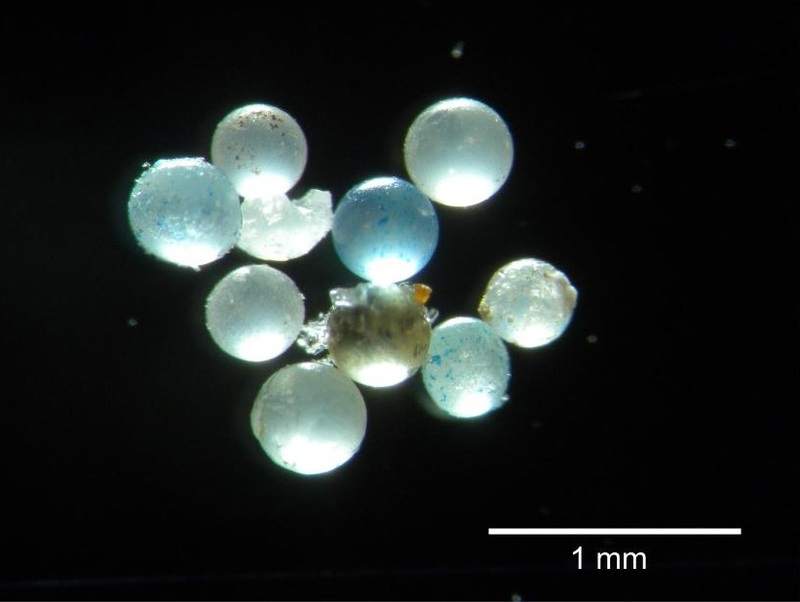 Experts warn that the environmental and health impact of microplastics is huge. Microplastics were highlighted as one of the key challenges at the Group of Seven environmental ministers’ meeting in the city of Toyama in May. 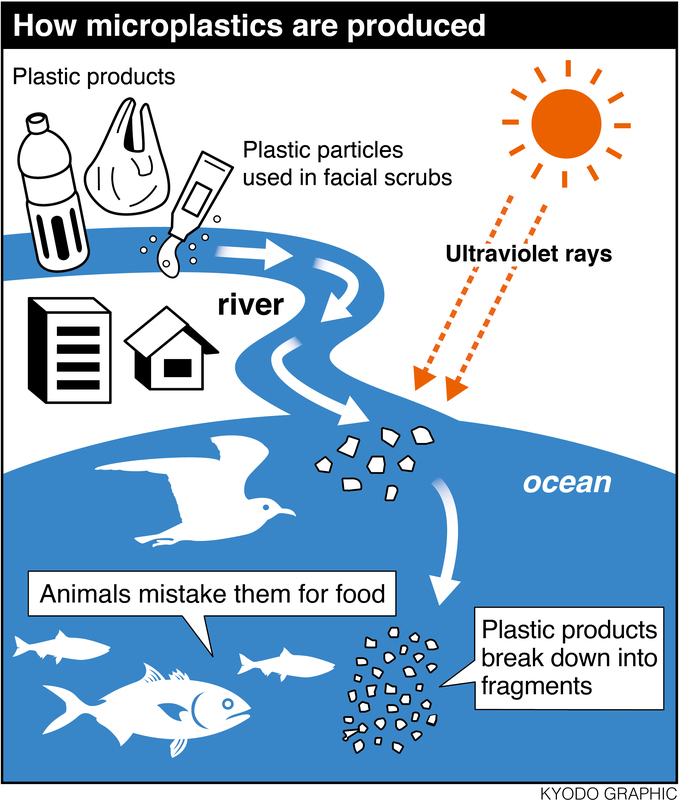 Microplastics are defined as plastic particles less than 5 mm in diameter. Plastics are processed as recyclable waste, but large quantities are mismanaged and released into the environment. According to Hideshige Takada, a professor at the laboratory of organic geochemistry at Tokyo University of Agriculture and Technology and a foremost researcher in the field, 90 percent of microplastics come from plastics that we use in daily life that fall through the recycling system, such as plastic waste that blows out of trash bins and washes into rivers or fetches up on beaches. When exposed to ultraviolet rays in strong sunlight, plastics decay and break into small pieces. When they become tiny particles, they are easily carried offshore and accumulate in the oceans. 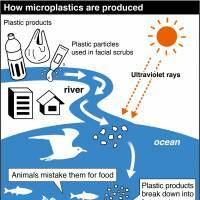 Microplastics also originate in facial scrubs and other cosmetic products that use small particles of polyethylene known as microbeads. Measuring a few micrometers in diameter, microbeads have been widely used in the industry, but the Japan Cosmetic Industry Association in March issued a notice urging its 1,100 members to stop using them immediately. Synthetic clothes also shed microfibers, which are flushed from washing machines into waste water, and into streams, rivers and oceans. What types of plastics are in the ocean? There are four types, according to Takada. Polyethylene, which is used to make soft plastic products, such as lids for containers and bottle caps; polypropylene, which can be used in making hardware, rugs and bottles; PET for clear plastic drink bottles; and the polystyrene used in Styrofoam containers. How bad is it near Japan? The Environment Ministry says the amount of microplastics in the seas around Japan were last year 27 times the global average. China and Southeast Asia are among the world’s worst plastic polluters, as reported in a 2015 paper by Jenna R. Jambeck published in the journal Science. The paper estimated 4.8-12.7 million metric tons of plastic waste entered the ocean in 2010. 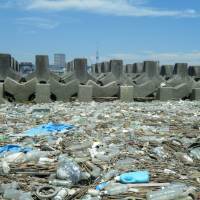 Some of the plastic waste was believed carried on the oceanic Black Current and washed up on Japanese beaches. 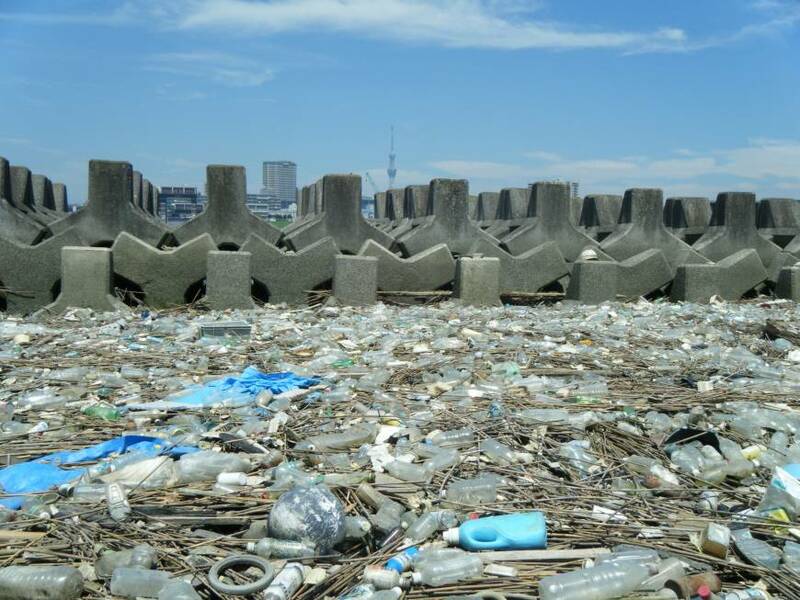 But that alone cannot explain the heaps of plastic waste in Tokyo Bay, Takada said, adding that large amounts of plastic consumed in Japan has reached its rivers and the ocean. For decades, plastic debris has been known to injure seabirds and other marine animals, by clogging up or otherwise damaging their digestive organs. But in recent years, plastic and microplastic chemical hazards have emerged as a major issue. Many plastic products contain toxic additives to increase their durability, such as nonylphenol, an endocrine disruptor that can cause breast cancer or endometriosis. 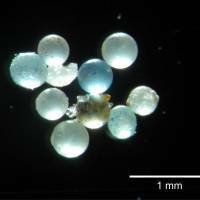 Microplastics also absorb pollutants from the ocean. Among the chemicals that stick to them are carcinogenic and highly toxic PCBs (polychlorinated biphenyls), industrial chemicals that were widely used in electric appliances until the 1970s, and PBDEs (polybrominated diphenyl ethers), which are used as flame retardants and affect thyroid function. 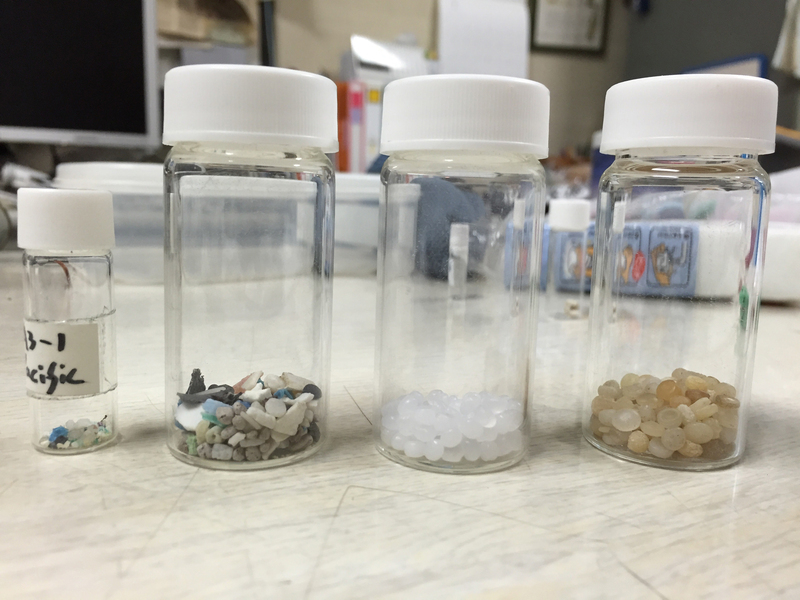 Plastic resin pellets, the industrial feedstock of plastic products and a type of microplastic, have a high affinity for pollutants because they dissolve easily in oil. Concentrations of PCBs, for example, are 1 million times higher in pellets than those in surrounding seawater, Takada has written. Chemicals in microplastics have also been found to accumulate in seabirds, he said. Is there evidence of an impact on health? A 2013 experiment by U.S. researchers found that medaka killifish fed microplastics for two months showed signs of stress in livers and developed liver tumors. 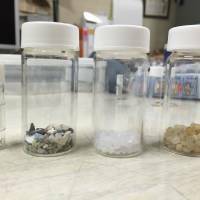 But the concentration of microplastics used in that experiment was more than 10 times higher than in the environment, Takada said. The level of pollutants accumulated in the human body, therefore, is not yet high enough to pose a health risk. But if the volume of marine plastic debris continues to swell, the amount of chemicals we consume through food could eventually threaten our health, he added. The first step is reducing our reliance on plastics by turning down plastic bags at retailers and reducing our consumption of one-use-only plastic water bottles. The 3R campaign — reduce, reuse and recycle — should also be stepped up, Takada said. The professor noted that retailers should also do away with excessive packaging and give consumers the option of biodegradable plastic containers or bags, even at a cost. Takada, in cooperation with other organizations, is now trying to develop cellulose nanofiber, a biomass material, as an alternative to plastics. “Some evidence, albeit limited, suggests that public perceptions about whether an item is biodegradable can influence littering behavior; i.e. if a bag is marked as biodegradable it is more likely to be discarded inappropriately,” the report concluded. Takada is asking people to mail him samples of plastic resin pellets. His team will analyze the pellets sent in from any beach from the world and send back data on the pollutants they contain, such as PCBs. For more information, visit www.pelletwatch.org.